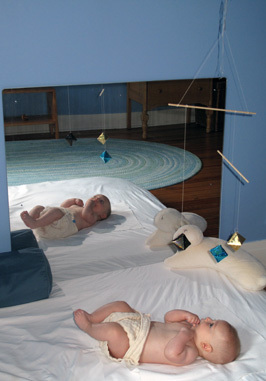 A floor bed provided by a single mattress or futon provides a place where your child can see the world without the obstruction created by the bars of a cot. When your child sleeps on a floor bed for the first three years of life she can move freely and get up and put herself to sleep when her natural rhythm tells her to do so. Place a few of your child's toys and books on low shelves in her room that she can access for herself. Make sure the room is safe by covering electrical sockets, securing electrical, lamp and curtain cords and providing stable shelving and furniture that cannot be pulled over. Whenever your child is sleepy or it is time for her to have a sleep put her down on the low bed so she starts to associate this as her place to sleep. Try not to rock her to sleep in a rocker or pushchair or on your lap as this encourages her to depend on this rocking as a means of getting to sleep. Allow her to crawl from this bed when she has finished sleeping and play with the selection of toys and books in her room. This gives her the feeling that she is in control of when she is asleep and she develops the habit of getting herself to sleep when she is tired and entertaining herself when she wakes up. If she is penned in to a cot with nothing to play with the only thing she can do is cry for someone to come and release her. Don’t think that just because you have decided that it is time for bed your baby will go straight to sleep in her low bed. She may cry to start with and even crawl out of it at times before she has been asleep. However, if you are consistent in your approach that the low bed is the place where she sleeps, and if she is not ready for sleep, she can play with her toys, you will find that she starts to put herself to sleep when she is tired and will get up and play happily when she has had enough sleep.